Some don’t see much of a resemblance to Michelle Obama whilst others say: Who cares?! 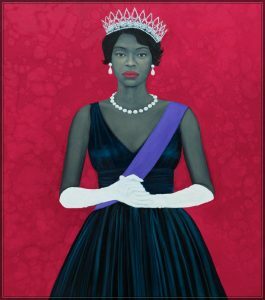 Painter, Virginia – After the official unveiling of Michelle Obama’s portrait for the Smithsonian Institution, debate immediately began on its likeness to the painting’s subject. Our painting expert, Amsterdam Douglass, believes a portrait painter has a wide latitude in which to express their creative interpretation of a person or object. Many others have a much differing opinion which generally goes like this: the painting is great, but should probably look very similar to the person who’s being painted. One critic of the portrait suggested that just the face in the painting be corrected to look more like the First Lady before it is permanently institutionalized at the Smithsonian.